Minister Rutley with Tree Champion Sir William Worsley and pupils from St Andrew’s CE Primary School. Photo credit: The Woodland Trust. 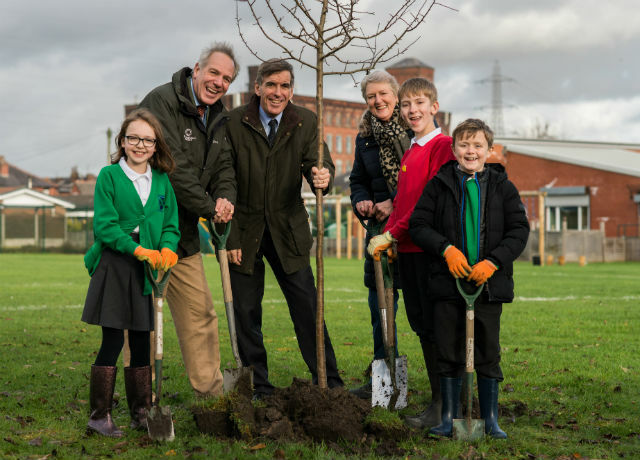 Forestry Minister David Rutley today joined the Woodland Trust, Community Forest Trust, Tree Champion Sir William Worsley and students from St Andrew’s CE Primary School in Radcliffe to plant the first government-funded tree of the Northern Forest. The Northern Forest, first announced by the Prime Minister in January during the launch of our 25 Year Environment Plan, will see 50 million trees planted over the next 25 years from Liverpool to Hull, backed by an initial government investment of almost £6 million. Spanning more than 120 miles between the cities of Bradford, Leeds, Manchester and Liverpool, the Northern Forest will help boost habitats for woodland birds and bats and protect iconic species such as the red squirrel – alongside providing a tranquil space to be enjoyed by millions of people living in the area. While on his visit, Minister Rutley spoke to the Bolton News and the Bury Times about the government’s ongoing work to grow woodland cover around the country. It is a privilege to be here to see the Northern Forest take root, and to plant the first of many government funded trees which will contribute to what will one day be a great forest. This new forest will benefit communities across the north of England and deliver on our pledge to leave the environment in a better state for future generations. The Northern Forest will connect the five Community Forests in the north of England – the Mersey Forest, Manchester City of Trees, South Yorkshire Community Forest, the Leeds White Rose Forest and the HEYwoods Project – with green infrastructure and woodland created in and around major urban centres such as Chester, Liverpool, Leeds, and Manchester.